An intruder will use a number of makeshift tools to snap the locks and, sadly, it can take just seconds to gain access to your home. No skill or experience is needed they will simply use physical force to break-in. Euro profile locks (better known as Euro Cylinders) are found in the majority of uPVC doors and are the most likely targets for this type of forced entry. A burglar could be in your home in 13 seconds using lock snapping. All burglars have to do is apply the right amount of pressure to a euro cylinder lock and remove the outside. Once the mechanism is exposed, it can be tampered with and unlocked, and this can allow the thief to gain entry. Can I stop cylinder snapping? Euro Cylinder, which is the only security cylinder currently on the market which has a TS007 3 star rating, SS312 Sold Secure Diamond Accredited and Secured by Design Accreditation combined. Anti Snap locks do snap. However they are made to snap in a certain place, a place that is far away from the central section. The central section is the vulnerable part of the lock and gives access to the multi-point-lock or dead lock. It is almost impossible to create an affordable lock that won’t snap, but with the Anti-Snap Cylinder, just the tip will break off, meaning the burglar will not be able to get into your home. How do you know the cylinder is snapped? If there has been a break-in or an attempted break-in, then there will be obvious damage to your door. The lock and cylinder will have been removed and the plastic covering of the handle will have been ripped off. Can you replace your own cylinder lock? It is unadvisable to secure your own home, if you are not an accredited locksmith. One reason would be that it may not fit to your insurance standard and you could be denied a claim if a break in happens once you have replaced your own lock. If you have had no locksmith training then you cannot be sure that your home is secured correctly. This could lead to more break-ins. It is always best to engage the services of a accredited, experienced locksmith. 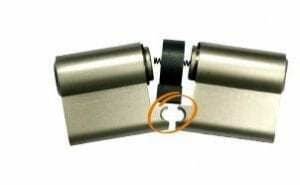 What are the best cylinder lock replacements to get? 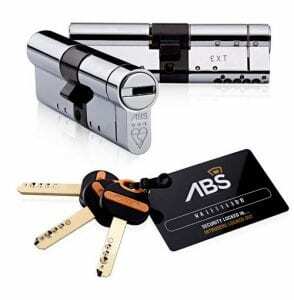 Keytek would recommend an ABS High Security Euro Cylinder. All of our local locksmiths are able to supply and fit an ABS High Security Euro Cylinder, to ensure your uPVC or double glazed doors are not only meeting your home insurance requirements but are also ultimately secured for your peace of mind when it comes to your home security. The ABS High Security Euro Cylinder is the only security cylinder currently on the market which has a TS007 3 star rating, SS312 Sold Secure Diamond Accredited and Secured by Design Accreditation combined.